Anything under the sun: NS Portal is turning 10. Have a Ben & Jerry's ice-cream on us! 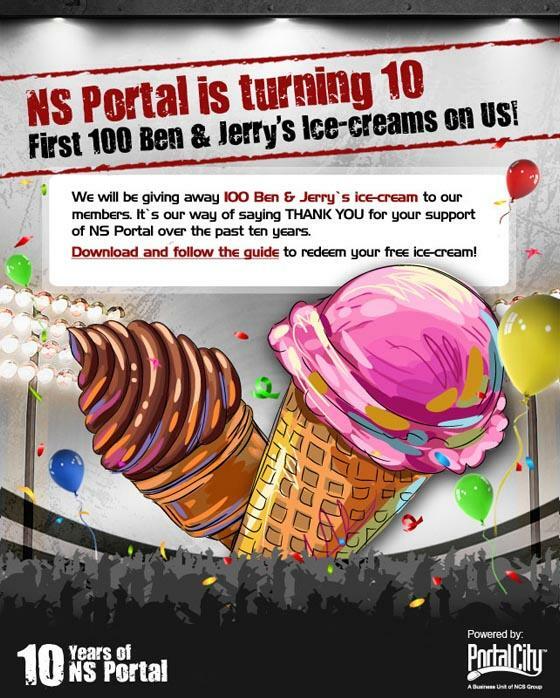 NS Portal is turning 10. Have a Ben & Jerry's ice-cream on us! This promotion is only available to members who have joined the Lifestyle Programme. Please log in to participate. 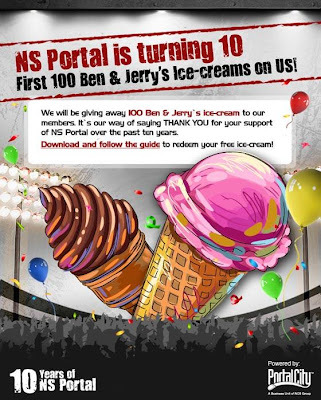 1.Redemption is only applicable for the 1st 100 NS Portal Lifestyle members. 2.Each member is only entitled to one voucher only. 3.Voucher is issued on the first come first serve basis. 4.Voucher is only valid on 22nd July 2011 between 12pm – 2pm. 5.Voucher is not exchangeable for cash and/or other items. 6.NS Portal does not hold responsibility for any losses, damages, costs and expenses incurred by any form of participation in this giveaway.